We already presented our WordPress widget to showcase your best articles. We made some improvement to the basic widget and want to share with you the new features. The widget is useful for authors who are using the G+ authorship system. It takes in input your Google+ id and list your most shared articles on the social networks. Who could gain from this widget ? Before entering into details, let’s see who is likely to use this widget. Take my friend Ann Smarty she is frequently writing on several websites. Her various writings are often covering complementary topics but his audience sometime does not know he is writing on other websites. She had recently published a viral article on one of these websites, but this cannot be reflected on her personal blog. On this private blog she wanted to showcase her best articles from all over the web, not only from her own blog. So, if you are like her, and write on several places around the web, you might want to display your ‘content portfolio’ too. Enters the Elokenz widget. How to install the widget ? This widget works with the database we are building with Elokenz. The first thing you need is to use the authorship tag. Then, depending on your installation, you can use the code we provide on our dashboard or the wordpress plugin directly. Once you have collected the good code (self hosted site) or the plugin, you have few settings to customize the display. First, the widget comes with two basic themes : bright or dark. Depending on your template you might need to have one or the other. If you need other colors, drop a comment below and we will publish an article to explain how to tune the CSS. Second : you might want to display 1, 2 , 3 .. or up to 10 articles. That’s pretty self-explanatory. The ordering system represent the algorithm that is applied to sort your articles. Do you focus on Facebook likes or on Twitter mentions ? 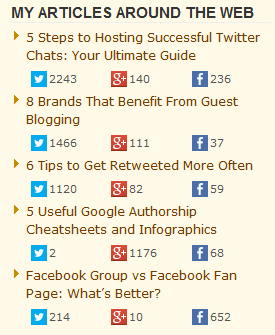 You can change the order here, or keep the default : sum of Facebook likes + Twitter mentions + Google+ plus ones. Finally, comes the only required field, your G+ id. For the moment you still need to copy/paste your id number. In the future we might implement a system to convert your ‘vanity url’ into the G+ id, but it’s not yet the case. Do you need the widget on a single page ? On WordPress we added a shortcode support recently. This means you can import the widget on a given page or post, instead of having it sitewide on your sidebar. (where 113400244614302404694 is replaced by your Google+ id). will output a list of 10 articles, with nofollow links, on a dark background, ordered according the number of RTs. Do not hesitate if you find any bug, let us know (the easiest is to comment here) … One of our early user Didier from KotonTeej was the first to discover a big flaw in in the previous version.